The eagerly-awaited GUKPT Manchester Main Event is underway with a monster £200,000 guarantee for the £1,100 buy-in Main Event at Grosvenor Casino Manchester. Among those competing on Day 1b are Grosvenor-sponsored Hendon Mobster Joe Beevers who won last night’s Omaha event. March 30 – April 2. Also playing today are Tom Middleton, Ben Dobson., Will Kassouf, Ben Vinson, Dean Hutchinson, Goliath winner Vamshi Vandanapu and two-time GUKPT winner Priyan Demel. There are 245 entries so far and late reg is open until 8.30pm so this year’s field is certainly beating last year’s 232 players. The Day 1a chip leader was local legend Steve Warburton who leads 35 players into Day 2. There is a live stream throughout the event on GUKPT’s live page. 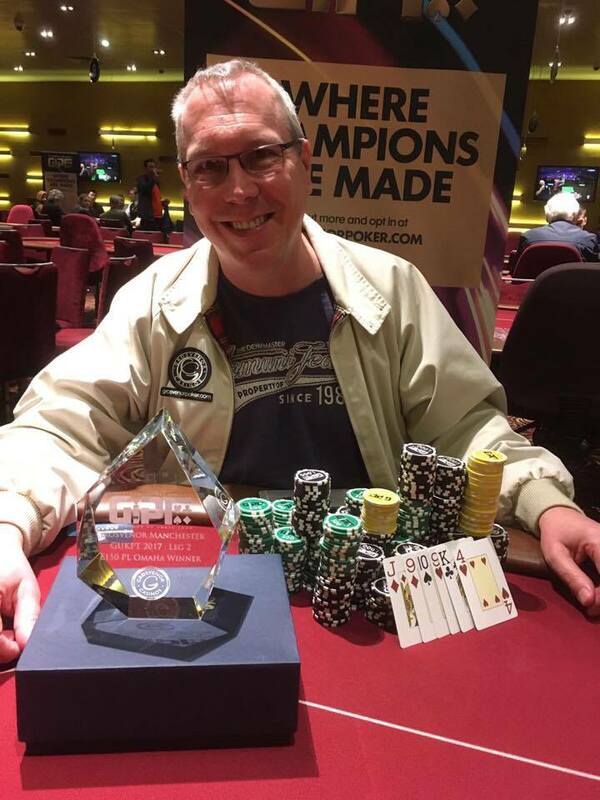 Grosvenor-sponsored Hendon Mobster Joe Beevers won yesterday’s £150 Omaha event for £1,390 after a cutting four-way deal with runner-up Alex Kiziltas, Mark Stephenson and Hayley Eskdale. There were 43 entries in total. The £220 Mini Main Event attracted 269 entries, creating a prize pool nearly three times the £20k guarantee. There were 27 players who got a share of the £53,800 total. Kam Lee won the event for £9,110 after cutting a four-way deal with runner-up Les Kearney, Joe McKeown (3rd) and Osman Mustanoglu (4th). Last year Reyaaz Mulla won the Main Event for a career-best cash of £58,300. He cut a heads-up deal with EPT Barcelona champion Tom Middleton before seizing victory and the GUKPT trophy. There were 232 players last year creating a £232,000 prize pool. 2017 is the GUKPT’s 11th consecutive season and promises to provide another record breaking year with a packed schedule and £1.8 million in Main and Mini Main guarantees. There will be nine legs in total this year before the GUKPT Grand Final takes place at the Vic in London in November.